The question is how do cell phone users communicate with each other? Home / Company / Blog / How Mobile Networks Work? The term mobile phones and cell phones are considered interchangeable terms. The main reason for using multiple terminologies is that mobile phones operate through a cellular network. The geographical area of a mobile network is segregated into multiple hexagonal cells overlapping each other around the edges. Each cell in the network has its base station which covers its segmented geographical area. When a user makes a call from a mobile phone, the signals reach a local base station. From there, they are retransmitted to a mobile device or forwarded to the other base station to relay the message to the cell phone lying in a different segment. Mobile phones use a low power signal to exchange messages between each other. The signal strength of a mobile phone is less than 3 watts. The low strength means that signals can only work between a defined distance. The question is how do cell phone users communicate with each other from different parts of the world? The answer: when signals become week, the base station captures them, and transmits them to the next closest station where they revitalize with the original strength. This allows information to remain confidential and strength to remain the same. 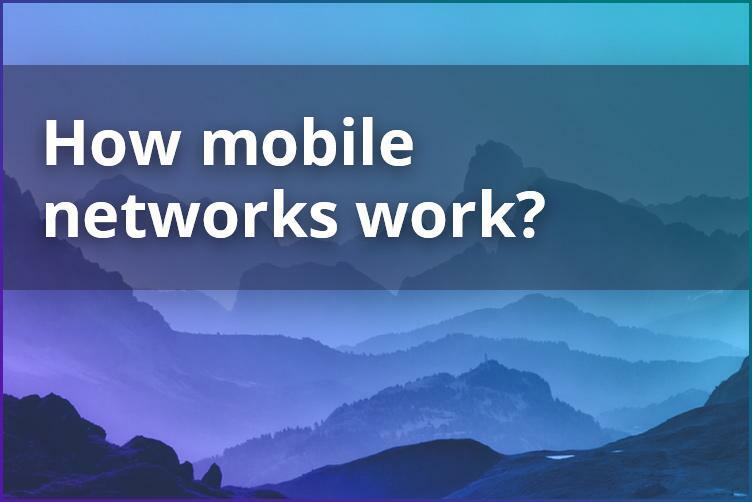 Mobile networks have grown over generations, and that’s why there are different types of Gs offered by cell phone companies. 1G cellular network was the earliest in the series, 2, 3 & 4G networks then followed it. Now, mobile operators offer LTE services as well. This was the first network that allowed mobile users to transmit text and video messages along with voice signals. The network first came into the market in 1991 and featured digital dial-up as well. GPRS or General Packet Radio Service was on offer in this network for the first time. It allowed wireless service between two devices throughout the day. With the addition of this utility, 2.5G replaced 2G. With 3G cellular networks, the transmission speed increased by many folds. While 2G networks allowed a maximum signal transfer rate of 100Kbit/s, 3G signals had a minimum rate of 144 Kbit/s. The advancement in wireless technology also played its role in taking the 3G network to an upgraded 3.5G network. The wireless technology included the GSM and CDMA network as well. 4G networks emerged in the late 2000s, with a peak speed of 100 Mbps for high mobility connections. For low mobility networks, the signal strength was lower. The technology is still one of the latest generations of cellular networks available in the market. It is backward compatible with 4G as well. Long Term Evolution or LTE supports multiple phone bands that surpass by a margin, what is achievable on a 3G network. LTE networks were improved considerably with LTE advanced technology which contains all the features of 4G technology plus some additional features. China mobile which has nearly a billion mobile users on its network. Verizon communication has a market value of almost 200 billion. AT&T has a market value of nearly 250 billion. Vodafone is also one of the top mobile phone subscribers with nearly 500 million customers. Why Does The MVNO Market Continue To Grow? How can mobile operators gain the trust of subscribers when planning the launch of next-generation networks? To answer the above question, Ericsson’s analysts conducted a large-scale research project in which they studied in detail the six key needs of mobile Internet users. 27 Sep 2017 V2V: When Cars Will Communicate? Over the years, video content has been a source of headaches for telecoms operators: the costs of its transmission grew faster than any revenues from it, and the viewer remained dissatisfied. However, as the technology improves and the behaviors of the viewer change, there are good prospects in this sector.